The new “Specials” DVD box set has just gone on sale and can be ordered from the Amazon here. 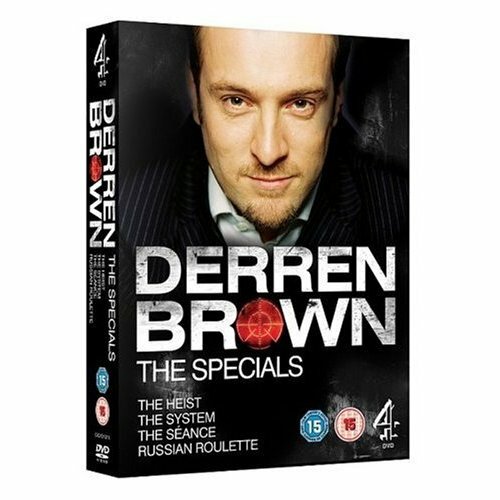 It’s a 4 DVD set of Derren’s 1 hour specials; The Heist, The System, Seance and Russian Roullete. I would have preferred to see The Gathering featured, or Messiah, as you mentioned. Still – all good. No extras, though, came as a surprise. Was this a conscious decision, or time-based? awsome choice. These are definitely the best choices. Any plan to compile the others? Perhaps I should of commented here *lol*. Anyhows… got set, extremely disappointed with the lack of extras/ backstage stuff. Fantastic! I just wish that all the special’s would get released. Along with the last series of Trick of the mind…and Trick or Treat! lol. I see shows are also now appearing in schedules for next year – just booked for Newcastle in anticipation. Oh . well, have lots of thoughts on specials … but none of them can be shared here! We in Holland consider lots to be specials in DB class. Hm … maybe if I jank my satelite dish a bit up and down … or make my satelite go to the right orb .. (remote control) .. yeah, will work out fine .. just fine ..
You’re all spoiled, you brittish people here … we on the main continent have to pay and fight our way into those things … Maybe we should get a clone of DB here. Hans Klok just will not do ..
YAY DERREN DVD’s for my collection!!! I understand, I’m very sorry I’m English… but there is a short film called “Medium Rare” Directed by The Great Stefen Stuckert and Produced by Debbie Young. Featuring Derren’s first acting role, as a very still, awkward Waiter – as shown on the Trailer. Which I believe has been shown all around Europe last year. Having greatly enjoyed your TV specials in the United States, when will a DVD Box Set for viewing in my region be available? I love Derren Brown and recently I got my Dad interested in them as well. Sadly only one of the dvds has subtitles. I seriously wish more DVDs would have subtitles, as it means we can actually watch them.